If you use your iPod touch while you’re down at the gym, out cycling or doing any other kind of physical activity, then you’ll know how frustrating it is having your iPod jumping around in your pocket. Cases with a belt clip aren’t great either as they slow you down, fall off and can be uncomfortable while you’re exercising. 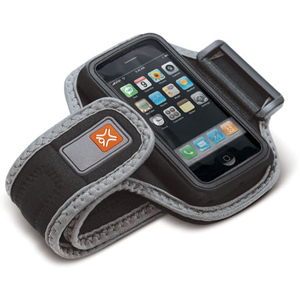 Fortunately there is a solution – armband cases. While it may seem a little unusual, it’s the perfect place for your iPod while you’re working out. They hold your phone securely, protect it from moisture and this one even has a cord wrap so that you won’t have the earphone cable getting tangled up with your arms as you’re running. It’s made from Lycra and Neoprene (the same stuff as wetsuits), can be adjusted to fit any arm and the clear cover doesn’t interfere with the touch screen of the iPod touch.